Announced in January as Project Shield, Nvidia's intriguing new handheld now has a price, a June release window, and the promise of Double Fine's Broken Age. Who's ready to spend $350 on a dedicated Android gaming device? 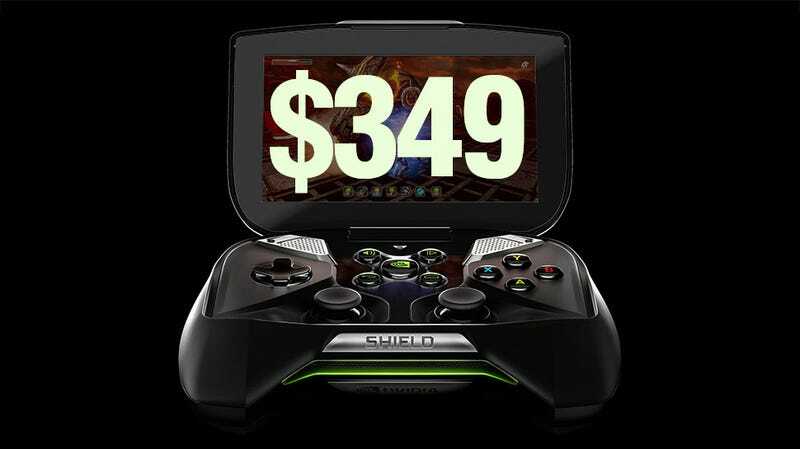 Now simply dubbed Shield, Nvidia's Tegra 4-powered Android portable / streaming PC game device will start accepting preorders today from folks who sign up for the newsletter at the project's website on May 20. The unit will begin shipping next month — just in time for the Ouya — and will be available at retail from GameStop, Newegg, Microcenter and Canada Computers. It's a hefty price tag for an Android device, but this is an Android device like no other, powered by the next generation of Nvidia's Tegra chips, with the ability to stream PC games from a computer outfitted with a GeForce GTX graphics card with virtually no lag. Here's Nvidia's official list of eye-catching features, which you can counter-balance with my own analysis of the device. It's a fair price for a luxury item, the sort of shiny new tech that no one really needs but some people can't help but want. Nvidia also sweetens the pot with five new games TegraZone games coming to the Shield later this year, including Double Fine's eagerly-anticipated Kickstarter-funded Broken Age. Double Fine is also bringing Costume Quest to Shield, with Steel Wool Games' Flyhunter: Origins, Dedalord's Skiing Fred and Chuck's Challenge 3D from Niffler rounding out the list. With the Ouya going wide next month, GameStick due out sometime soon and now Shield dropping in June, it's going to be an interesting spring for Android gaming. You can read more about the Shield launch and the upcoming games at Nvidia's blog.